So here is something funny. 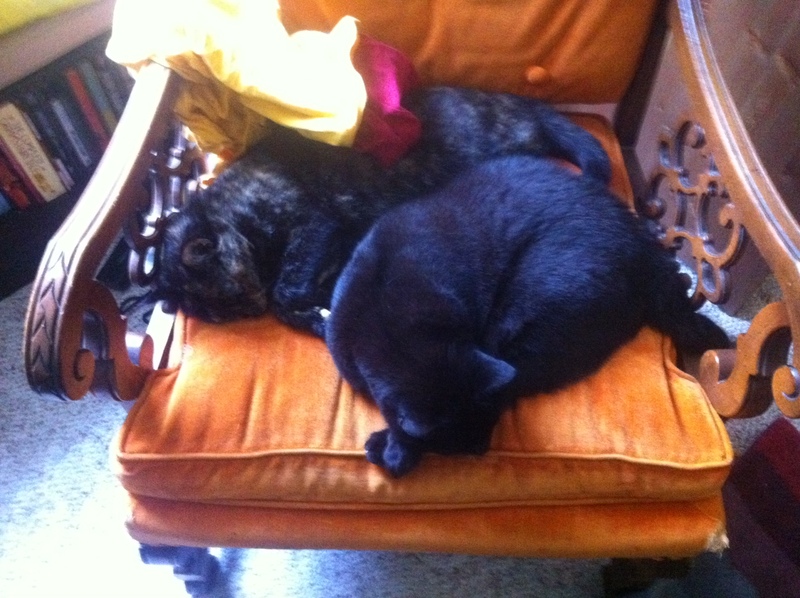 They are kind of fat and lazy. But on Wednesday they were on their toes in front of the pie safe* in the dining room, trying to get under it. I assumed they’d lost a toy down there, so I took a quick peek. Nothing – just some dust, an old hair band, and a dark shadow. Oh well, I thought, they’ll get over it. Me: Is it a mouse? D: It is not a mouse. D: It is not a bunny. D: I don’t want to tell you what it is. D: I think it’s a snake. First we panicked. Then we called one Don Kloss, Wild-Man-of-Nature Extraordinaire. He told us to put it in a box and take it outside. Easy enough. Except–how do you “put” a snake in a box? Cut to me, belly on the floor about 6 feet away from the pie safe, shining a flashlight into the darkness while Donna stood to the side of the pie safe, Jacob’s bo-staff in hand, smacking the side of the pie safe. R: No, that’s not working, you’ll have to sort of poke it underneath. D: I can’t see underneath! R: I know, I’ll tell you what you’re touching. Ok, yeah, that’s good, no, not there, to the left, yeah, ok, ok, ok, it’s moving, it’s moving, it’s definitely moving, oh crap it’s just in the other corner. This went on for some time. Finally the snake slipped into the Magic Bullet box we’d set for it and we stuck a copy paper box lid on top of that. Great plan, except the lid and the box were two different sizes. I couldn’t pick the box up. So we slid it along the floor, through the house, and out the back door. 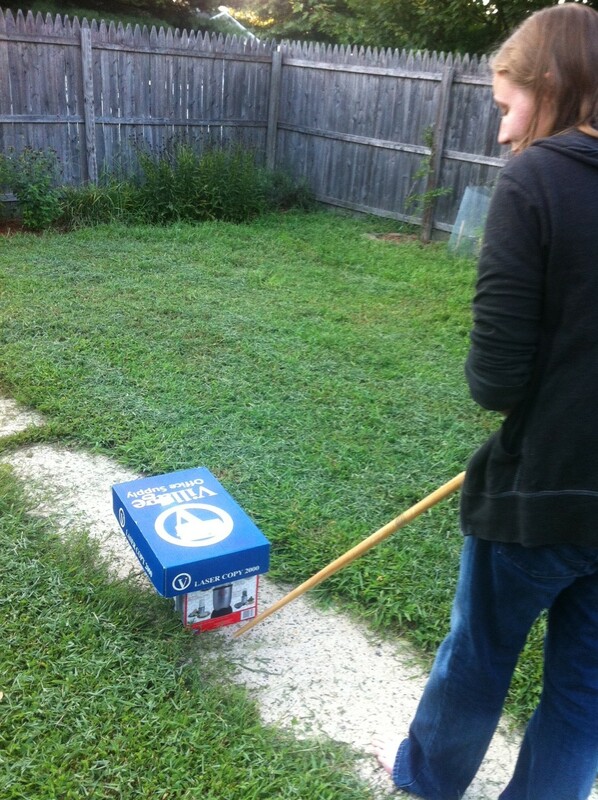 At this point, Donna determined the safest, least-icky way to move the box would be to push it out of the yard using, once again, Jacob’s bo-staff. Phew. That was enough excitement for one night. 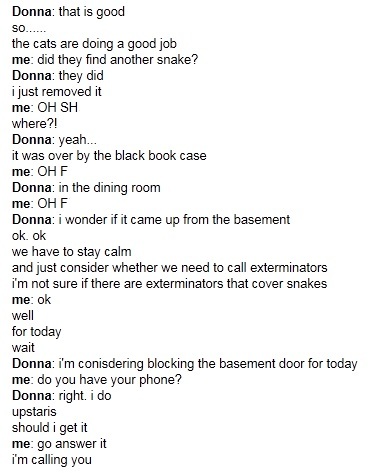 I called a service that deals with this kind of stuff and scooted out of work to meet the Snake Charmer at home at 4 p.m. One hour, 4 Facebook status updates referencing the basilisk from Harry Potter, and a not-small sum of money later, my house was declared a snake-free zone. Big ups to Chris from Critter Control, who not only performed his magical snake voodoo but also approached my crazy neighbor about his crumbling foundation that provides a perfect haven for snakes, admired the abacus I gave Donna for Christmas, and then conversed intelligently with me about the state of politics in NJ and universal healthcare. Tonight: I just want to eat a nectarine. *So what? I like pies, and I don’t want anyone to steal them. I have a pie safe. Previous postthat’s me in the spotlight. I hear that, Rachel – our weather is just starting to warm up here and the snakes are getting restless – we often get them in the fire station (haven’t had one in my house, though) – do you have many poisonous ones in your neck of the woods? Thankfully no, Scotty – all the poisonous ones live with you! Really, though, out of something like 200 species in NJ, only about 10% (if that) are venomous. I know there are a couple species that nest in our area (the Timber Rattlesnake, for instance, is pretty common in most of the US, including NJ), but I’ve never had a real run-in with them. 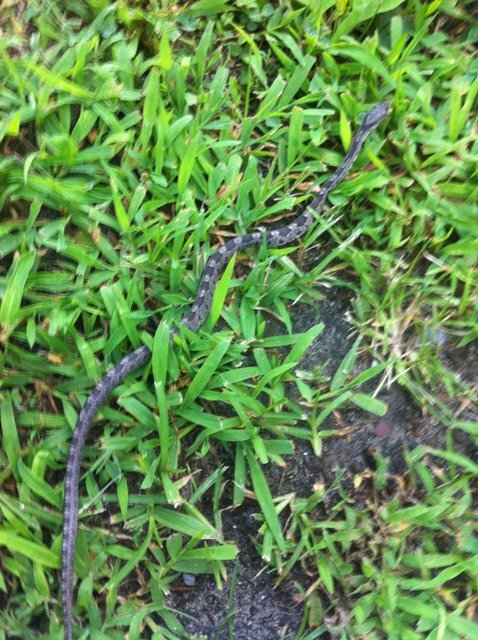 These guys (or maybe “this guy,” since we’re not sure if it was two or the same one turning up twice) appears to be something like a juvenile Black Rat Snake – relatively mild, non-venomous. Just a little bored, apparently, and looking for some excitement indoors.